Once a project has been created you can define the budget values by estimating the hours and purchases consumed. Click on Projects 1 from MANAGEMENT and then select the project. In the Budget 2 section, specify the estimated hours in the field Team 3, even if the working team has not yet been assigned. Use the calculator to calculate the cost in hours in accordance with the standard cost. In the Purchases budget you can also assign an estimated budget and, by calculating the sum total of hours and purchases, obtain a general project budget. 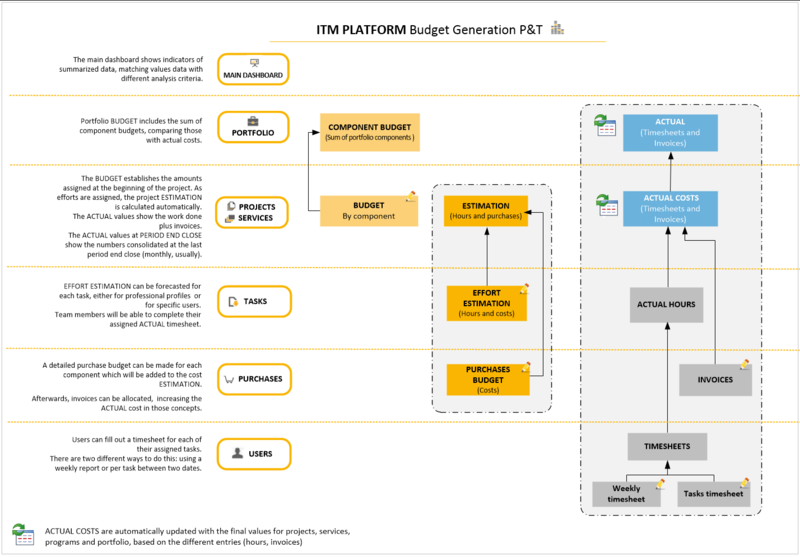 The estimate of hours and the corresponding cost is a calculation performed by ITM Platform depending on the efforts defined in the tasks by the project leader. Similarly, the estimate of purchase costs will be dictated by the sum total of the budgetary items allocated to the project. Go to Projects 1 in MANAGEMENT, and then select the project to calculate the cost estimate. In the Budget section, as efforts are assigned to tasks the cost estimate is calculated on the basis of the hours assigned in the Bottom-up Estimated Cost 2. This allows you to view the Difference To Archive Top-Down 3, revealing the economic deviation compared with the general budget. The budget data are therefore first entered before detailing the project, with a calculation performed in the cost estimate once the efforts and purchase budgets have been calculated, while the actual values are progressively updated by means of the project team hours reports.